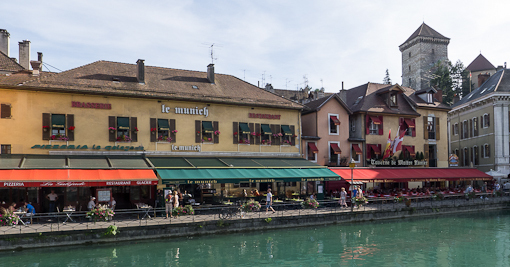 Annecy is a touristy town in the Haute-Savoie region of France, so there are restaurants and cafes everywhere you turn, especially in the old town area (see earlier post). 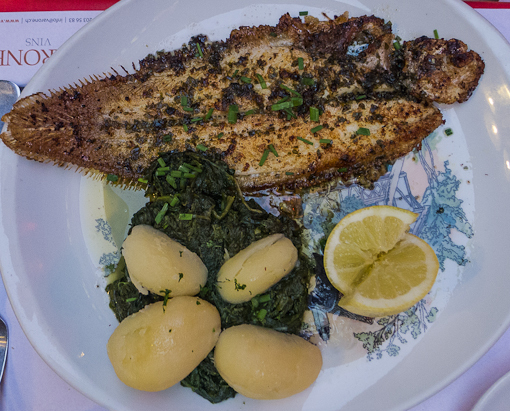 The local specialties – Savoyard dishes – typically served on black slate, feature cheeses and cured meats (which we had plenty in Switzerland). So we feasted on beef throughout that weekend. 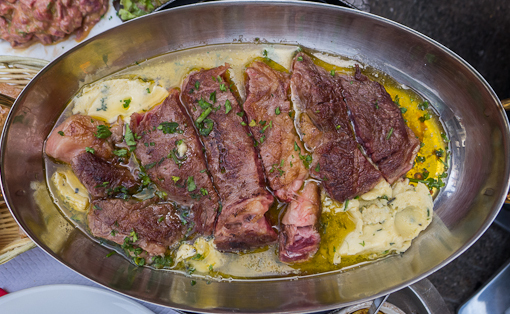 Beef cooked in butter at our table. 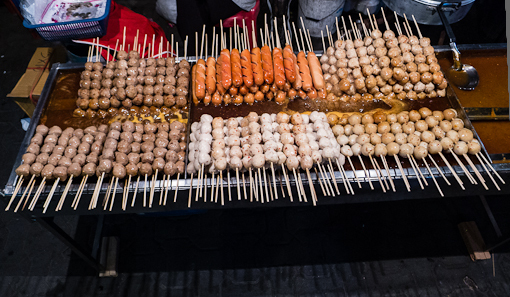 Cholesterol overload ! 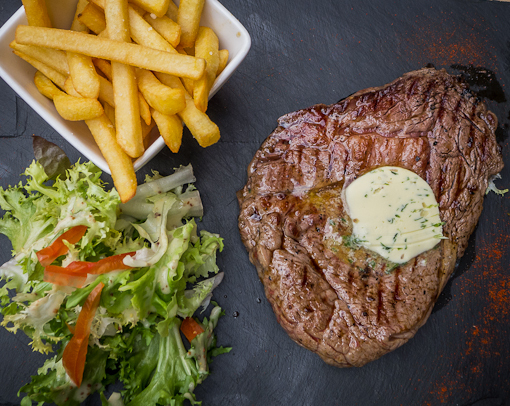 Beef grilled and served with herb butter. Some of the fries in this region are cooked in duck fat. 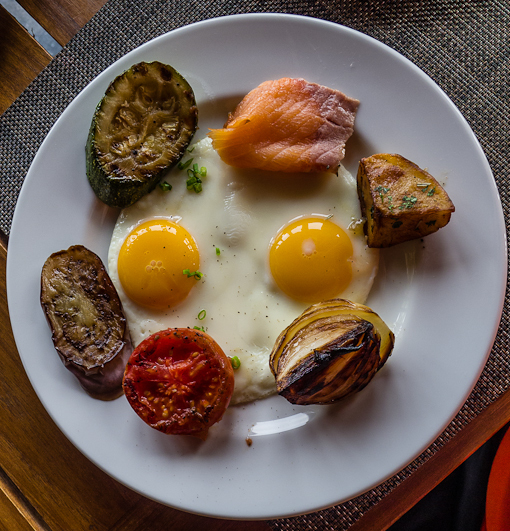 We were not searching for a gourmet experience and did not consult any restaurant guide. We just picked those places that looked comfortable. 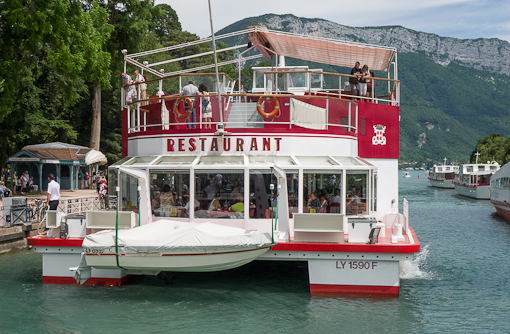 There is a restaurant boat – the MS Libellule – which serves lunch and sunset dinner on the lake. We did not book in advance and missed it. 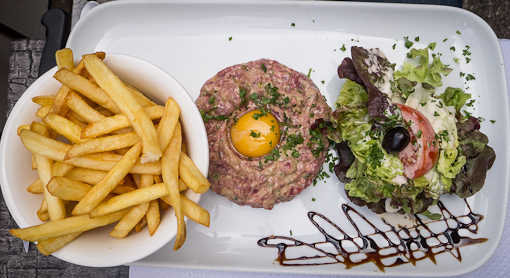 Many of the tourists visiting Annecy came from other regions of France and because Savoyard dishes are somewhat different from the rest of the country coupled with the idea of terroir, they loved the local stuff. 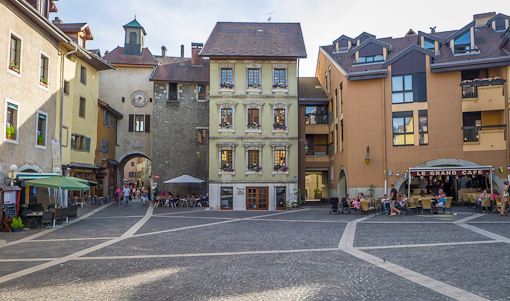 This region (Haute-Savoie) became part of France in the 19th Century after it was sold to France by the Piemont noble family. The amount of mussels served in that pot was enormous, a rare occasion when an European dish beats the size of a regular American portion. Yeah! 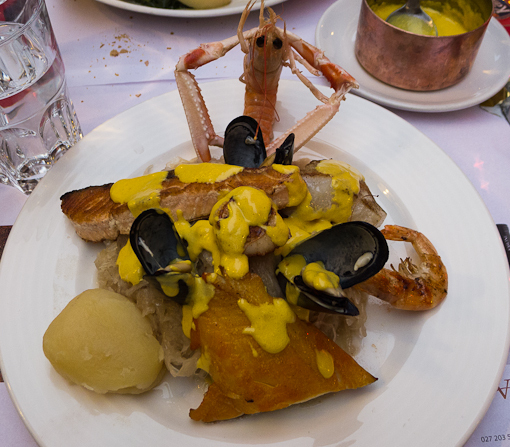 This dish – la choucroute (de la mer) is unusual as it serves potato and sauerkraut (piled under the fish) with seafood instead of sausages or pork meats. I did not put that langoustine up – that was how the dish arrived. 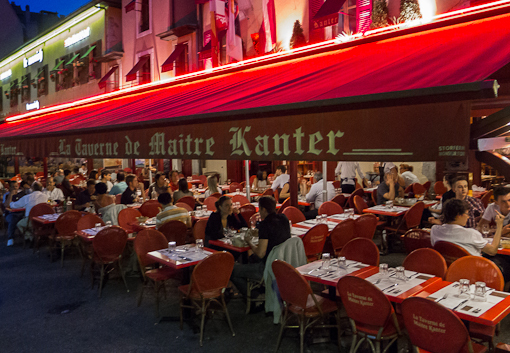 We had the choucroute at La Taverne de Maitre Kanter – apparently the only Alsatian brasserie in Annecy. (The Alsace region is further North of here, bordering Germany, which we will visit soon). 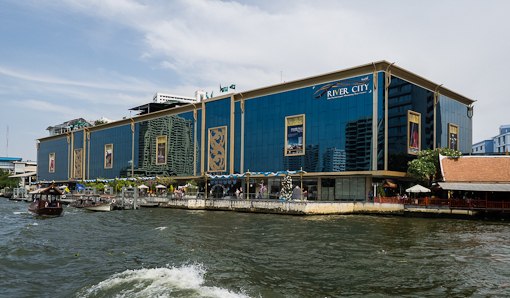 Many of the restaurants are located along the waterways. 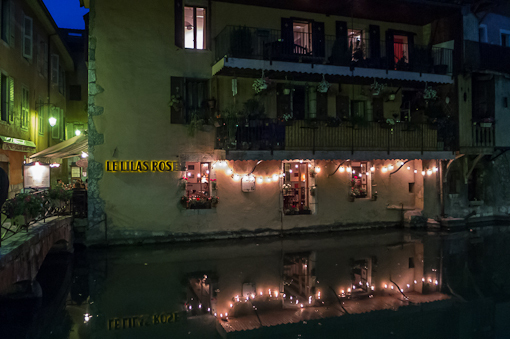 For some restaurants, you can see them across the canal but can’t get there without finding a bridge first. 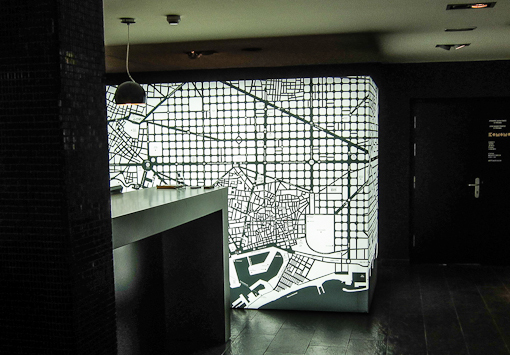 And when you have crossed the bridge, the entrance to the restaurant may not be prominent because the dining room may be located at the back facing the canal while the kitchen is on the street side. 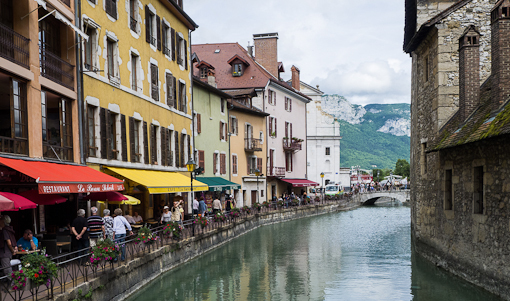 We would like to come back to visit Annecy and explore the communities around the lake in the summer next year. Staying further out on the far side of the lake and hopping over for dinner, perhaps by boat – sounds like a plan. 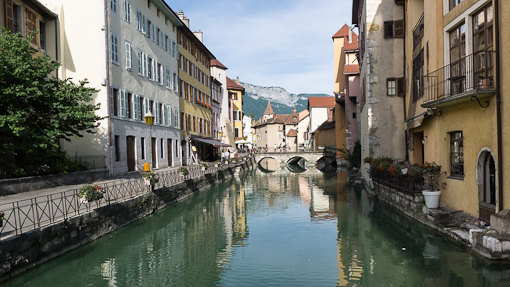 Annecy is located about 100 minutes drive from where we live. We knew about the town and had wanted to visit it for the last 2 years. But it was only until June last year when we spent a weekend there. Yeah, this post has been in the draft folder for months. 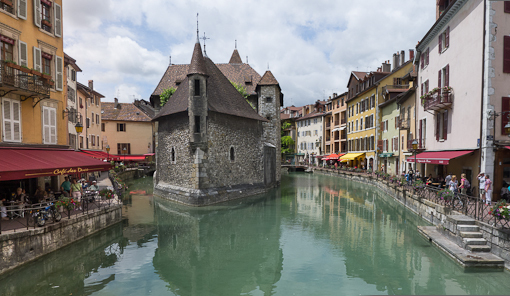 Annecy is the capital of the province (department) of Haute-Savoie. 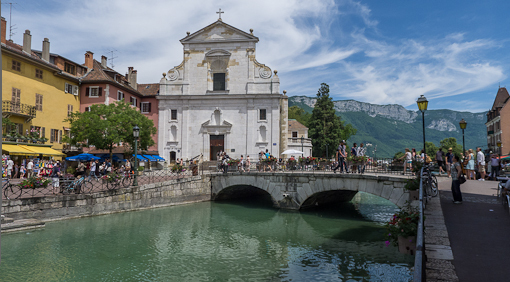 It lies on the northern tip of Lac d’Annecy and is 35 kilometres south of Geneva. 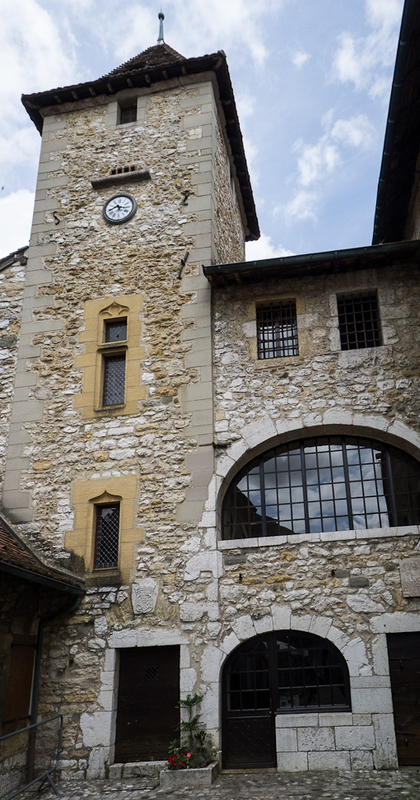 The Palais de l’Isle, also called the “old prison”, was built from the 12th century. 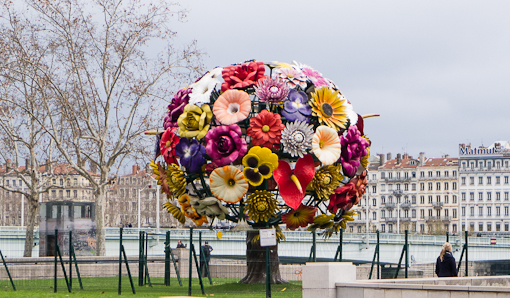 It is the symbol of the town and is among the most photographed monuments in all of France, according to Wikipedia. 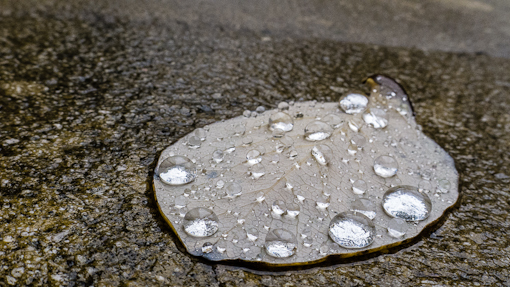 With these pictures, we are helping it keep that status. 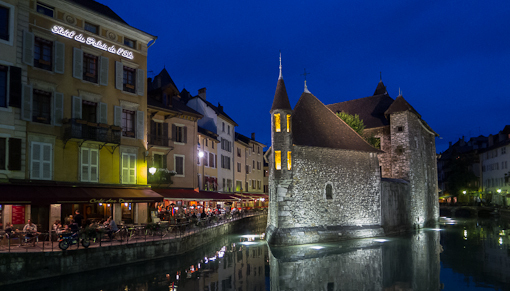 Annecy has hosted the Annecy International Animated Film Festival since 1960, an event we just missed by only a few weeks. We have to remember to attend this festival next year. 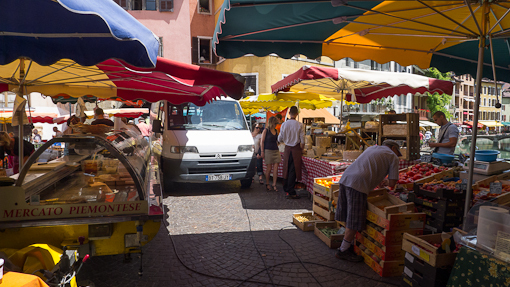 We arrived around noon on Saturday when the town’s market was in full swing. 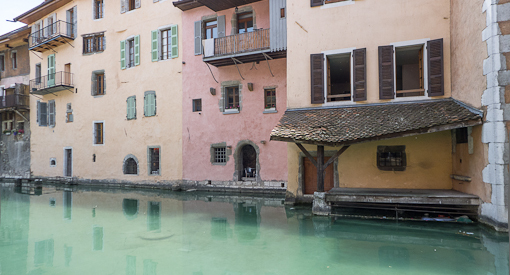 The town has many waterways criss-crossing it – some said that it is the Venice of the Alps. 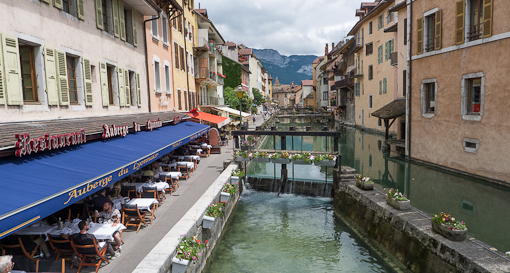 We think there is a huge difference between the two – Annecy’s canals are so much cleaner than that muck in Venice – there is no comparison. 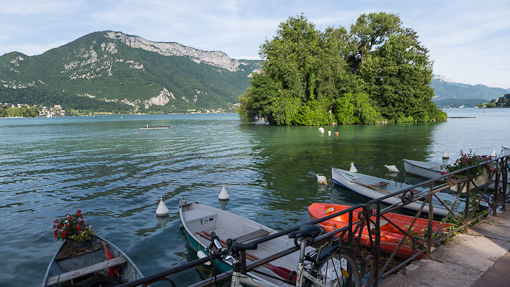 The town is on the shore of Lake Annecy, the second largest lake in France (if Lake Leman is excluded) and reputedly the cleanest lake in Europe. 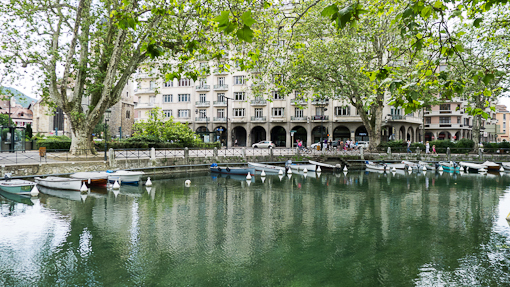 There are a lot of public spaces around the lake front – sightseeing ships, peddle-boats, speedboats … All forms of enjoyment of the lake are catered for. 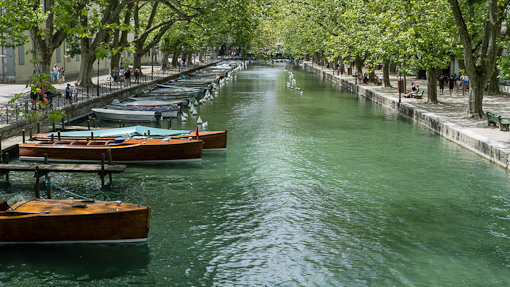 In my opinion (Chris’s), Annecy is the most pleasant city that is integrated with a system of waterways. This is based on our recent visits (see earlier posts) to several cities with canals – Milano- Il Naviglio Grande (one canal), Colmar (small network of canals) and Amsterdam (a much bigger system with a harbor). 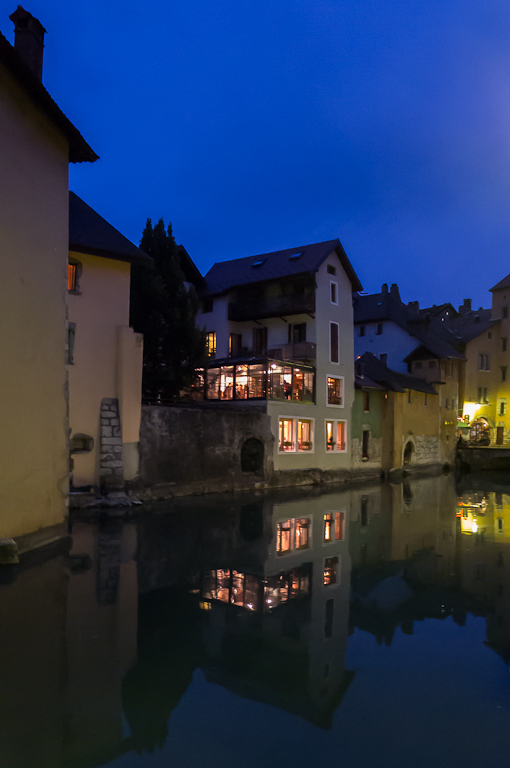 Annecy is full of restaurants – next post! I(Chris) have not read a non-fiction cover to cover for a long time (in fact, I can’t remember the last one). Recently, while I was in Boston, I toured the bookstores of MIT and Harvard (see earlier posts here and here). This book “Good Thinking” was displayed on the “staff’s pick” table in the MIT Press bookstore. 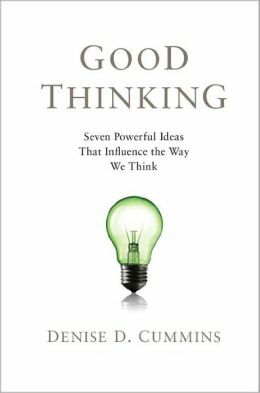 The full title of the book is “Good Thinking – Seven powerful ideas that influence the way we think”. It was not hard to read the book because the conceptual topics are written in a way that is concise without sacrificing readability. And just the right amount of examples, including some mathematics are employed to illustrate the concepts. As I am impatient and cannot stand those books that are dominated by case studies or lengthy expositions, this author seems to have found a good balance for my taste. The book has 184 pages, averaging about 25 pages per idea – not bad, given volumes have been written by many about these ideas. I will just briefly mention what those seven ideas are. 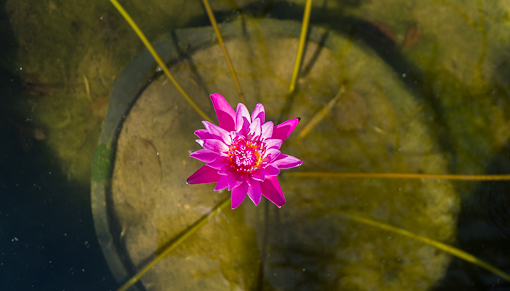 #1 – Rational choice: choosing what is most likely to give you what you want. #2 – Game theory: when you’re not the only one choosing. #3 – Moral decision-making: how we tell right from wrong. 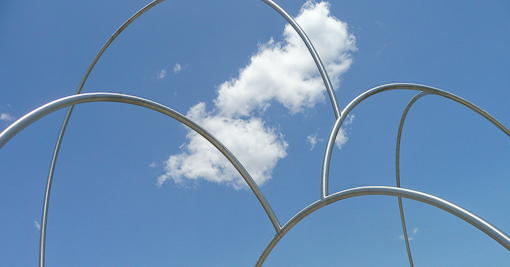 #4 – Logic: the search for truth through argumentation. #5 – Scientific reasoning: hypothesis testing: the search for truth by evaluating evidence and causal reasoning – explaining, predicting and preventing events. #6 – Problem solving: the search for solutions to an unwanted situation. 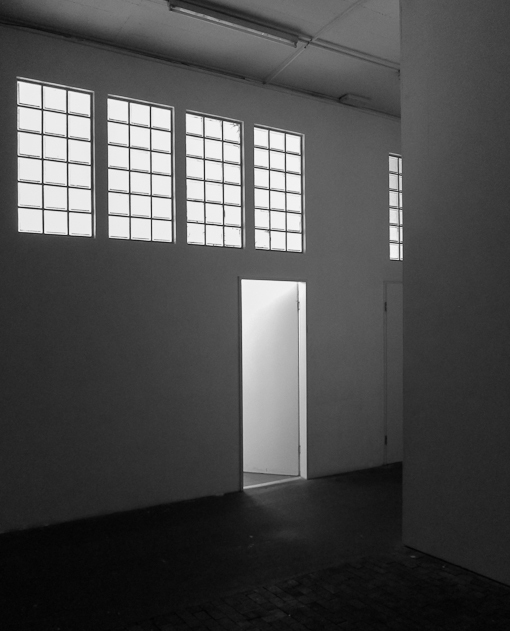 #7 – Analogical thinking: the realm of insight, discovery and genius. Here are a few comments about the book from reviewers. A recommendable read if you are in the mood of thinking about thinking. In case you are wondering, the photos (except the book cover) were taken at home, in nearby towns, in Lyon, Barcelona and Bangkok. 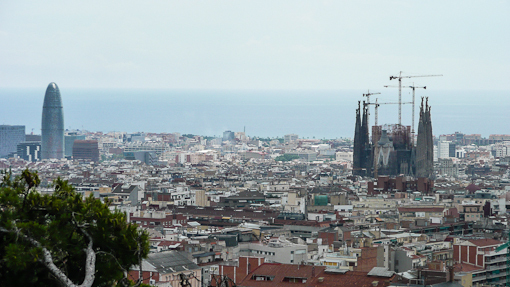 The following incidents happened a year and a half ago when we were visiting Barcelona (the post was half-written and forgotten in the draft folder). I(Chris) lived in NYC for many years (even before Giuliani became mayor) and had not been a victim of crime. I walked through Times Square with thousands of tourists daily for the last 10 or so years and had not witnessed a pickpocket or mugging incident. 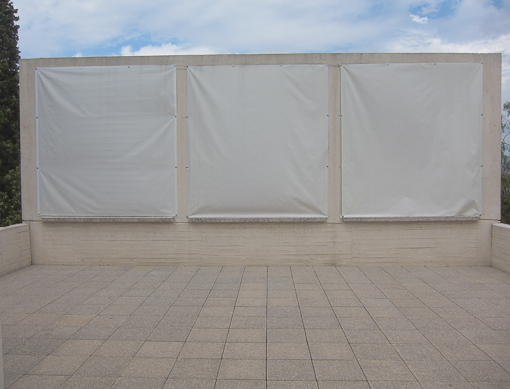 But in Barcelona, for just 9 days, we had three stories to tell. 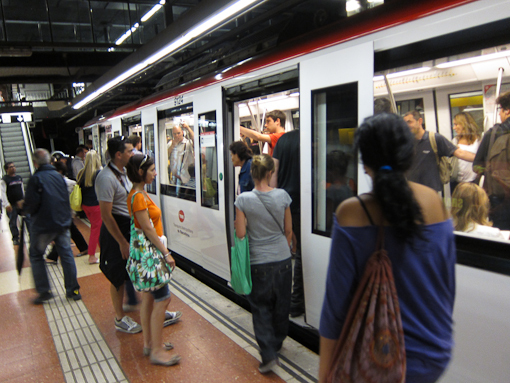 They all happened on Barcelona’s fairly modern, brightly lit subway platforms. No crime was committed in the first incident. One night when we were changing trains at a station in the city center (Urquinaona), after we reached the second platform, Sis whispered to me that three men at the end of the platform followed us and looked at me in a suspicious way. Well, there were a lot of people changing trains but when I casually looked over, I agreed with Sis’s assessment. The three men pretended they do not know each other, yet they kept walking up and down the platform, exchanging glances. The train arrived, we got on, and that’s the end of the story. Perhaps we were oversensitive? The next night, we were taking the subway home and had to change train at another centrally-located station (Pg. de Gracia). As it was late, the platform was rather empty. When the train door opened, I stepped onto a carriage after Sue. Sis was behind me. Suddenly, I felt someone tugged at my bag and Sis said to me, “Be careful, someone is trying to pick your bag !” I looked at my shoulder bag with the camera and wallet and it was halfway unzipped. It all happened very quickly. 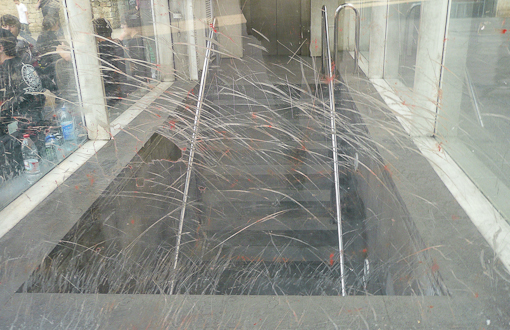 A man who was standing at the landing of the carriage got off the train immediately as the train door closed. I was half-way to becoming a victim. This pickpocket was apparently operating solo. I stared at him and he stared back as the train was leaving the station. Sis explained: when the door was opening, there were plenty of space on one side to board the train. But this man cut in front of her as I was stepping on the train. She then saw him reaching into my bag. So she slapped the hand and raised her voice. She was my heroine. On our last day in Barcelona, Sis had already left a day before. Sue and I were doing our last bit of sightseeing. 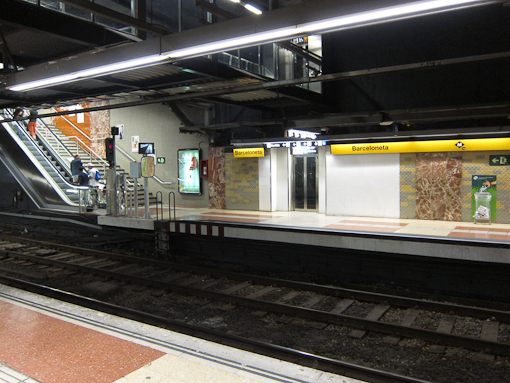 It was around noon, when we walked down the stairs onto a platform at the Verdaguer station. I noticed three guys in smart street wear standing near the entrance, just like any typical young European tourist. But all three were looking at me at the same time – and just for a little bit too long – which seemed a bit unnatural – did I look strange or something ? As the train pulled in, we noticed the three guys running towards a door. 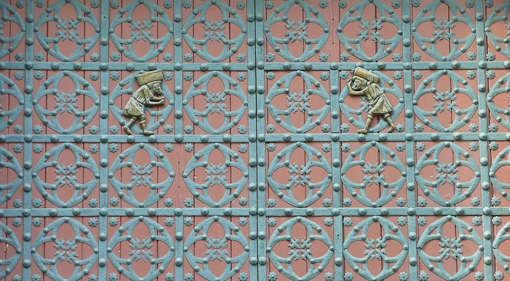 I told Sue to avoid using that door and used another one further down. After the last two incidents, I learnt to not rush onto the train but to hang back so that there is nobody behind me when I step onto the train. As soon as we were aboard, we heard people yelling and a woman screaming. These three guys were trying to take either a camera or a handbag from this Asian couple – we only saw them struggling with something that had a strap. 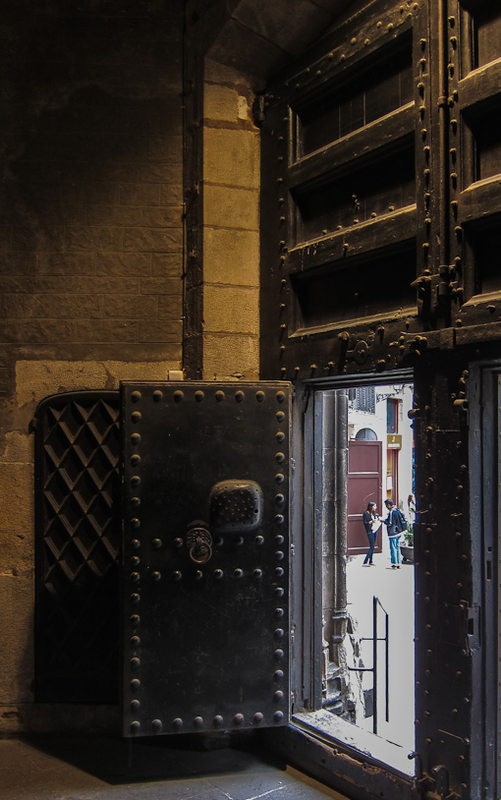 As the doors were closing, the gang got off while holding onto the thing and the couple would not let go – so they all ended up getting off. We did not see how it ended but there were hardly any one on the platform as the train was leaving. 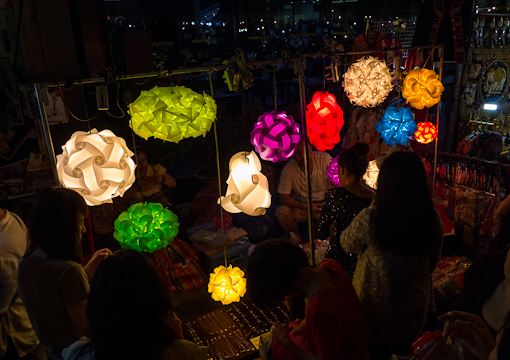 Asian tourists are every where in Europe and particularly the nouveau riche – they love to splurge and flaunt. Many are walking around with armfuls of famous brand shopping bags – marking themselves as easy fat targets. 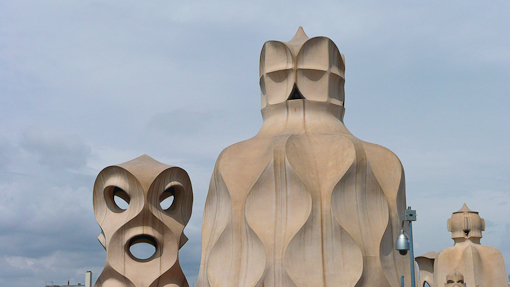 Another incident which happened on the same Barcelona trip was described in an earlier post – Close Encounters of the Shifty Kind. Check it out. All the above pictures were taken in Barcelona, although the train platforms in the picture were not the ones where the incidents happened. 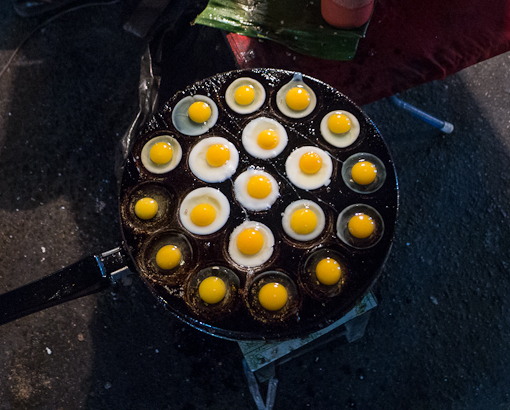 Before we finish our run of photos of Thailand, here is another set of paired snapshots from Thailand. The idea is that the paired snapshots, while taken at different occasions, share a common theme. Part 1 is here. 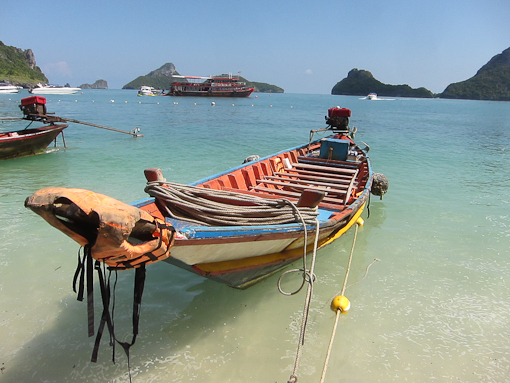 Recap: two weeks in Thailand at the end of 2012, from Chiang Mai to Bangkok and then Ko Samui. 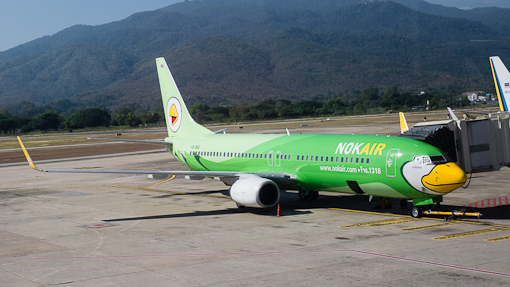 Nok air, with a fleet of planes each decorated as a smiling cartoon bird. Any idea of what this is ? Herb balls for massage at the Asia Herb Association, Bangkok. 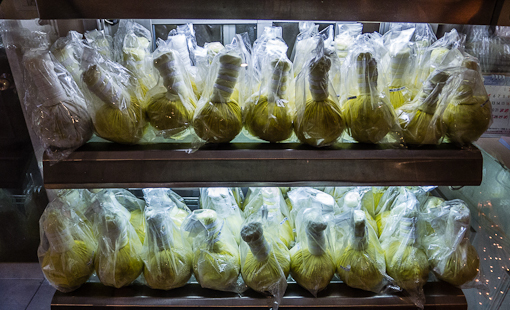 They were stored under refrigeration to keep fresh and can be purchased for home use. They were used on our backs. 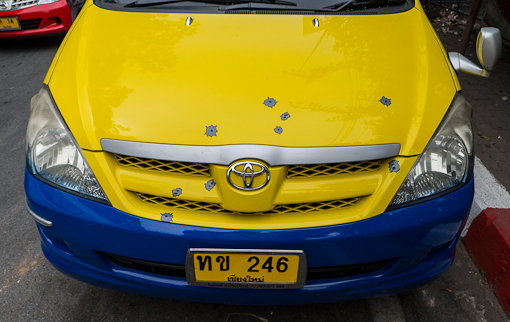 Hilariously practical sign outside the Grand Palace, Bangkok (see our post here). According to the label below each of the figures, top row: sleeveless shirts, vest, short tops, see-through tops; bottom row: shorts, torn pants, tight pants, culottes and miniskirts are prohibited. 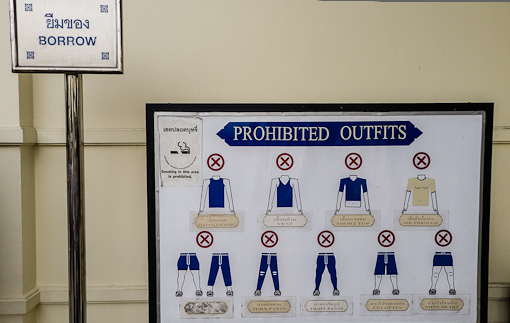 Tourists can rent (even it says “borrow”) the appropriate attire – essentially giant shirts and baggy yoga pants – before being allowed to enter. 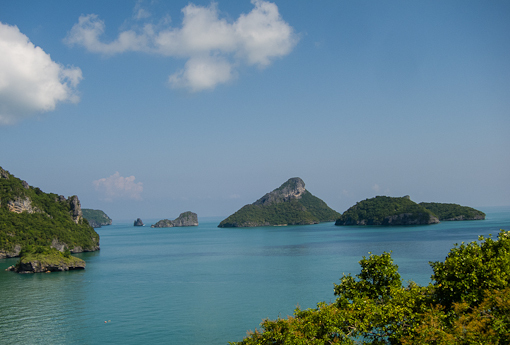 Moulin Rouge on Ko Samui – from “Brittney Spear” to “Madonna”, from “Lady Marmalade” to “In the Navy”. 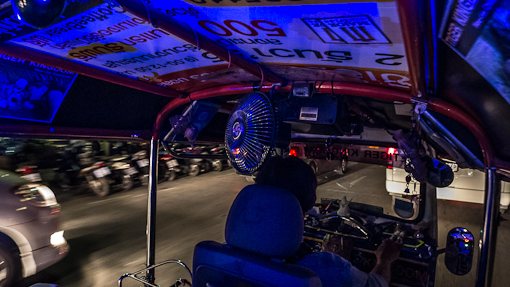 Our tuk-tuk in Chiang Mai was equipped with fan for passengers, stereo system and black light. They are very compact (when sold), practical, and colorful, but are really 3D jigsaw puzzles in disguise and an advanced degree in geometry may be needed to assemble them. 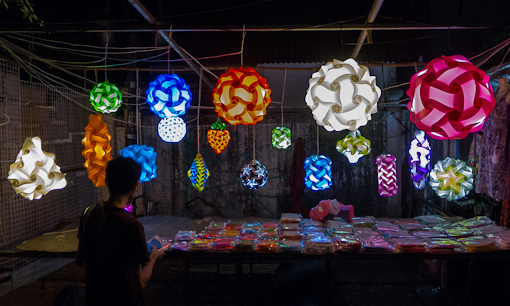 There are as many variants as there are stalls selling them in the night markets of Chiang Mai and Bangkok. 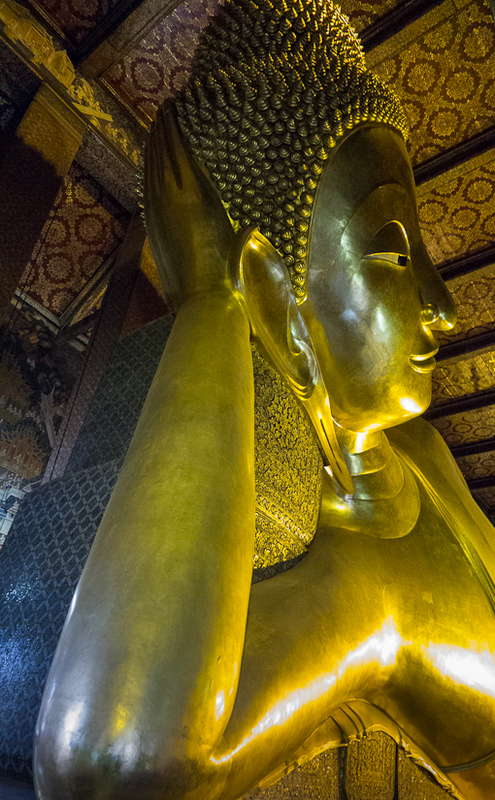 Wat Pho is a temple located adjacent to the Grand Palace in Bangkok, and is very popular with tourists. 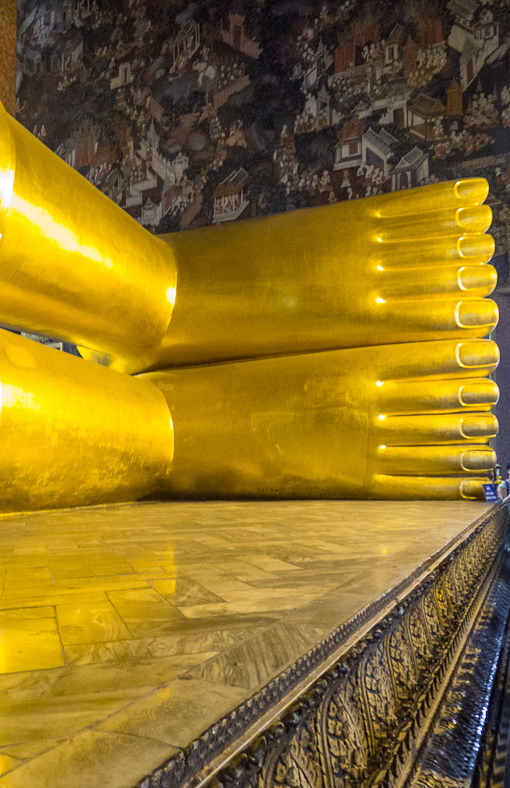 See our earlier post about the Grand Palace complex here. We visited the temple after our tour of the Grand Palace. 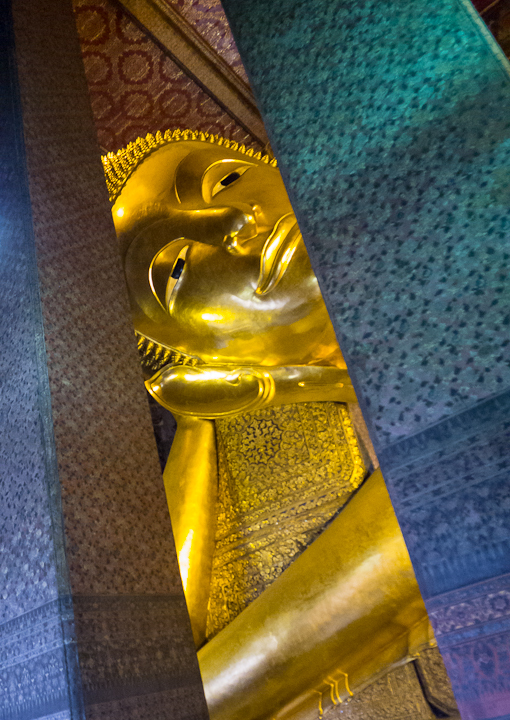 It is famous for its gigantic reclining gold buddha. 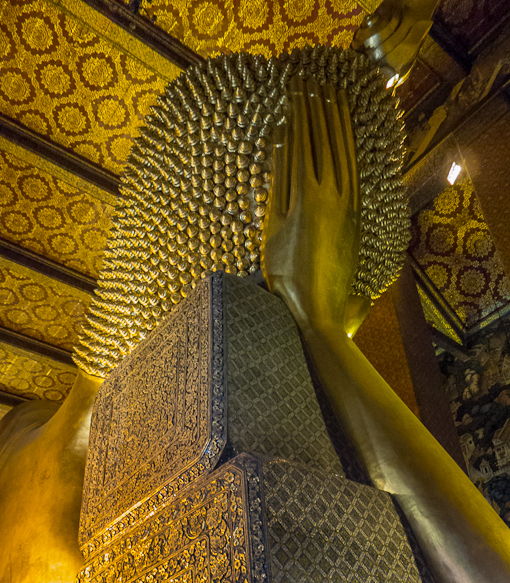 The temple, being a historic place for the learning of religion and science, is also recognized as the birthplace of Thai massage. 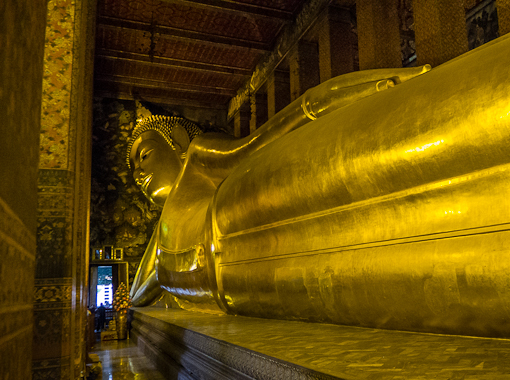 The statue of reclining Buddha is 15 m high and 43 m long with his right arm supporting the head. Much more information about Wat Pho can be found on Wikipedia, here. 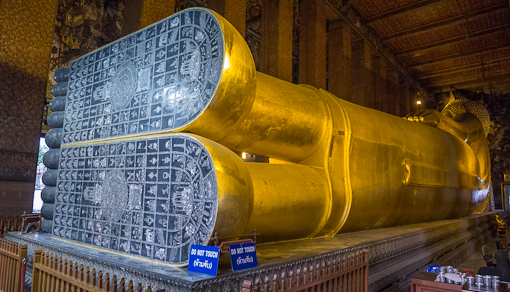 The foot of the buddha statue is 3 m high and 4.5 m long and are inlaid with mother-of-pearl. 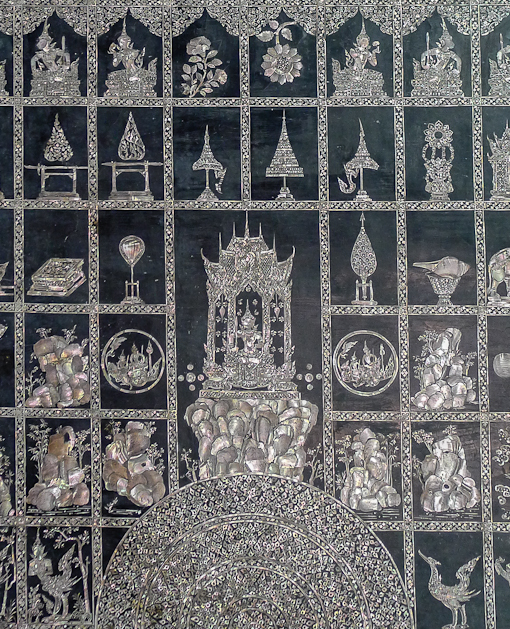 The panels are divided into 108 panels, each displaying one of the auspicious symbols by which Buddha can be identified, like flowers, dancers, white elephants, tigers and altar accessories. 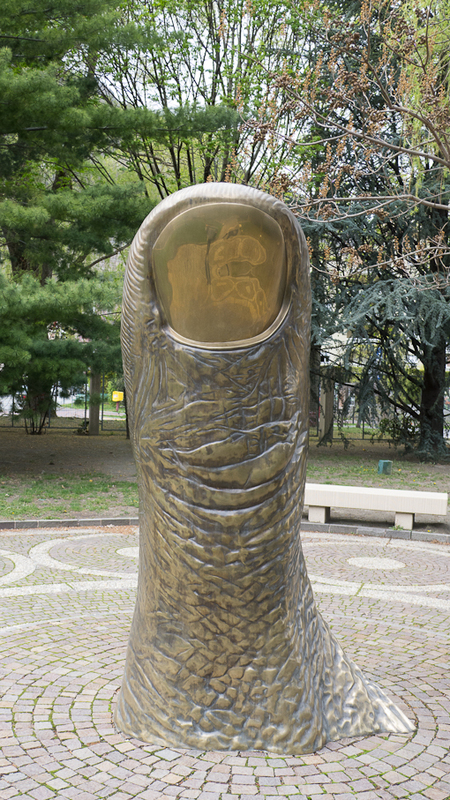 Except the head, the statute’s body is smooth and metallic – it reminds me more of a robot than a religious figure. 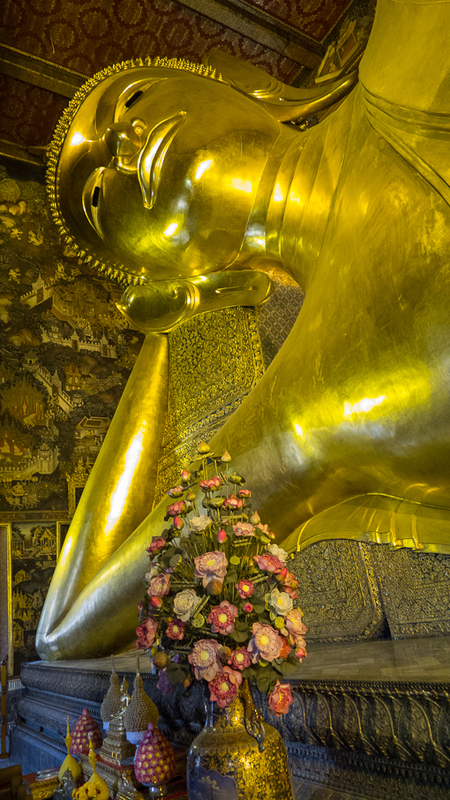 And I already remarked here about the resemblance of C3PO and Thai statues. 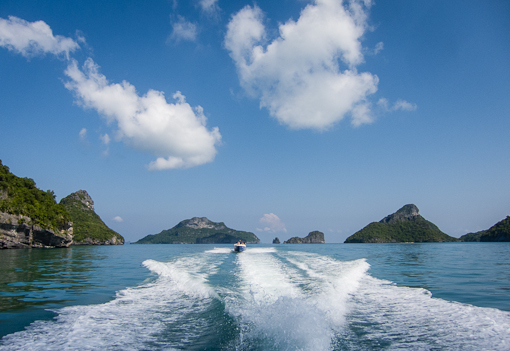 We went on two speedboat tours in the Gulf of Thailand on two consecutive days – the first day to see Ko Tao and Ko Nang Yuan and the second day to visit the Ang Thong Marine National Park (Ang Thong = “Golden Bowl”, see part 1 here). We were lucky because as you can see in the photos the sea was very calm. 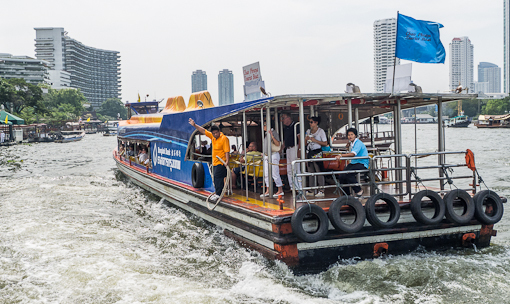 Many visitors on Tripadvisor complained about seasick and getting drenched in a speedboat on the rough sea. 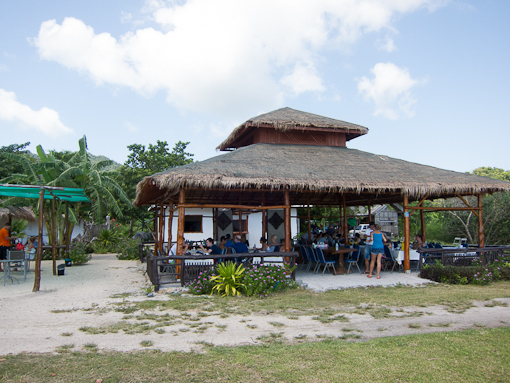 After cruising around the Gulf to see the various islands, we went to lunch at a simple restaurant on Ko Paluay, one of the bigger islands. We had some really fresh tasting all-you-can-eat shrimp tempura. 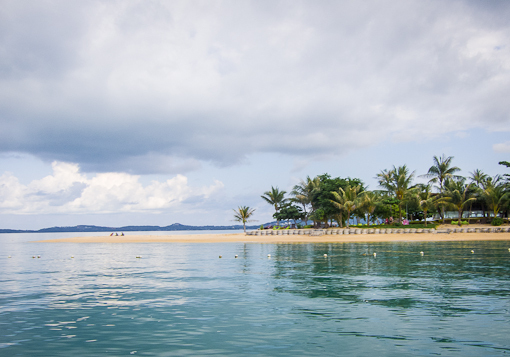 Although the islands are part of the marine park, only some are owned by the government. 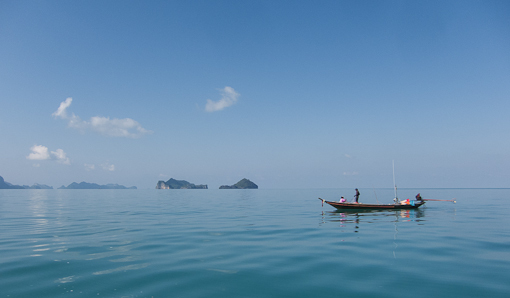 The islands on the southern end of the park are inhabited by families of fishermen who continue to make a living on the fishing grounds in the Gulf of Thailand (and run tourist restaurants on the islands). 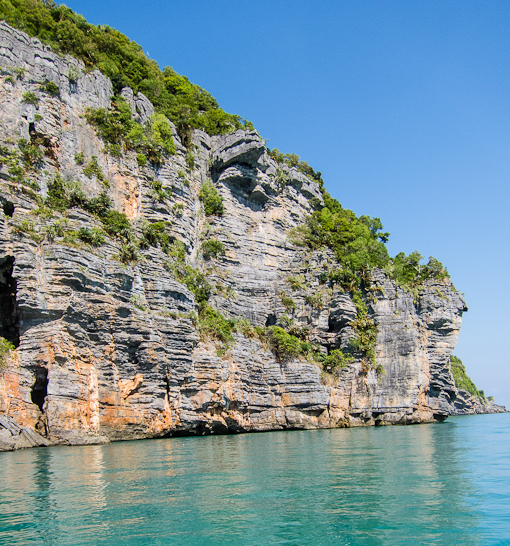 The islands in the park are made of limestone with steep cliffs, hidden lagoons, beaches and caves. 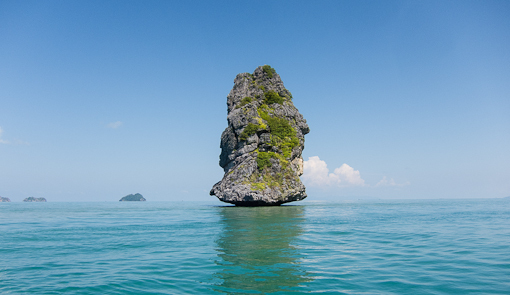 This must be the most iconic rock in the Gulf of Thailand. Looks like it is hovering above the water. 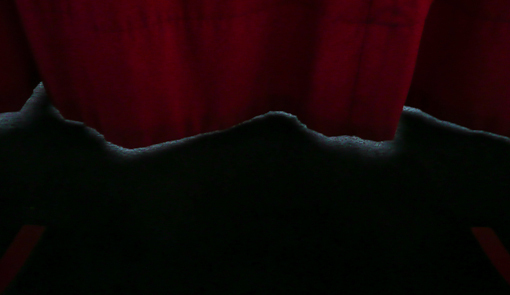 Same rock as above, view from another side. 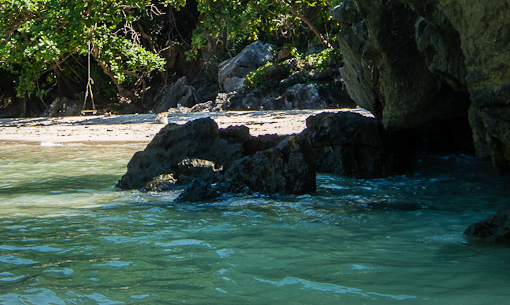 After lunch, our boat cruised to a beach to swim, kayak, and relax. We were the first boat to arrive after lunch, hence the tranquility. A few more boats came later. An impromptu game of takraw (or sepak takraw) was started on the beach by the crews of several boats (hollow rattan ball kept aloft and passed between players by using only feet, chest and head, essentially kick volleyball). I(Chris) walked parallel to the coastline, around an outcrop of rocks in shallow water (towards the left side of the photo above), and found a secluded beach. The water in the channels between the rocks was just knee deep and calm enough to allow me to use the camera while wading through. I could have continued walking in shallow water parallel to the coastline and would probably find more beaches like this one. The beach front and the rocks behind it were full of small white butterflies, usually a chain of them, one chasing the other. A swing hangs from a leaning branch. We borrowed this one picture of the islands from Wikipedia. 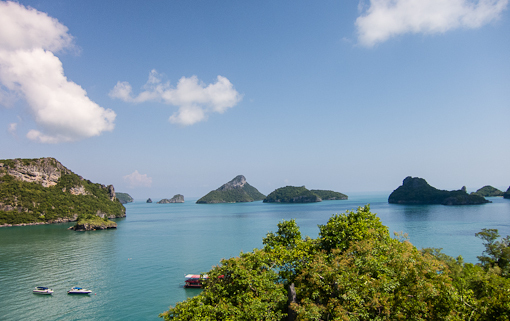 It was taken from a viewpoint high on Ko Paluay which we did not have time to ascend. 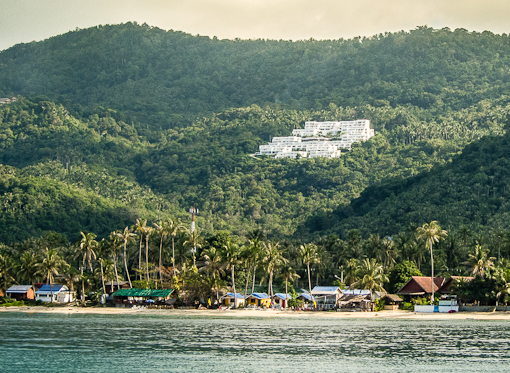 On our way back, we had a chance to see the north shore of Ko Samui where the most exclusive and remotely located resorts are hidden. 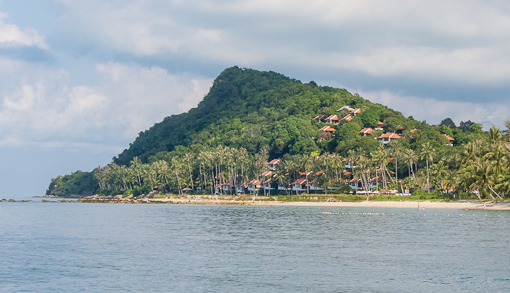 The bungalows and facilities are scattered on a headland and hidden from view by the trees on land but not from the sea. A sand spit extends into the Gulf. 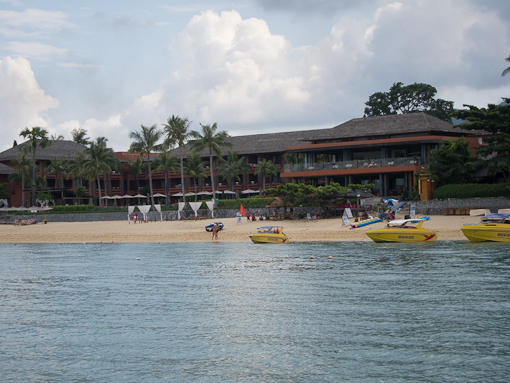 At the end, we were dropped off from the boat at the beach in front of our resort, Hansar (see our post here). 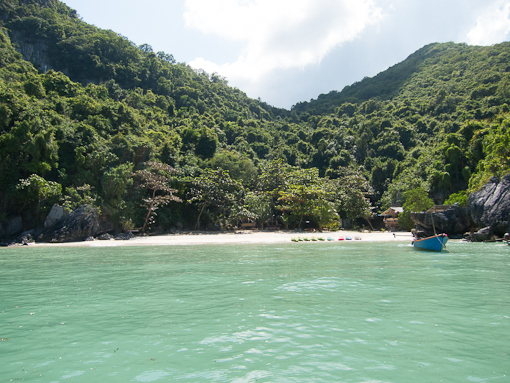 The beach is steep enough to allow the front of the boat to go all the way up to where we could hop off onto dry sand. 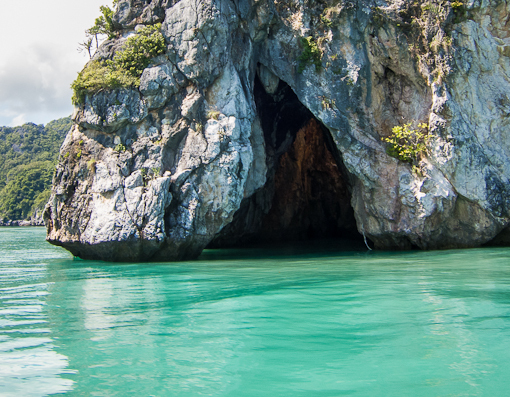 We hope to go back and spend more time on the islands – however, we would charter our own boat (surprisingly inexpensive if you organize a small group) to discover the hidden caves and hard-to-reach beaches, which can be your private beach for a few hours. 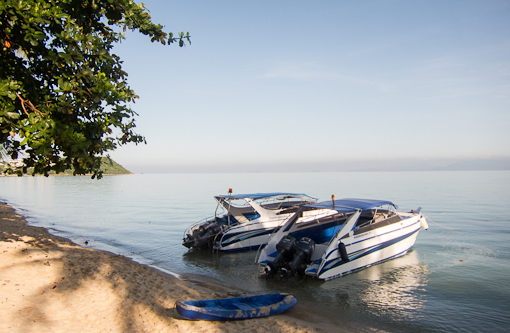 During our stay on Ko Samui, we went on two speedboat tours of some of the neighboring islands. On the first tour, the highlight was snorkeling in the clearest waters around Ko Tao and Ko Nang Yuan (see earlier post here). 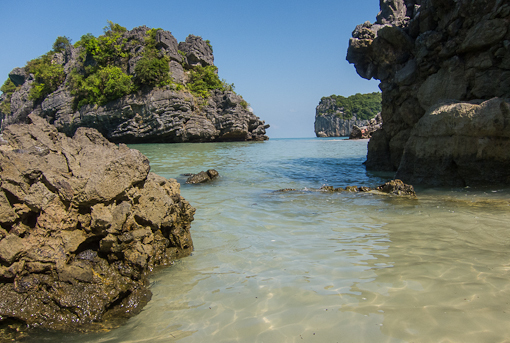 On the second tour, the Ang Thong marine national park was our destination. 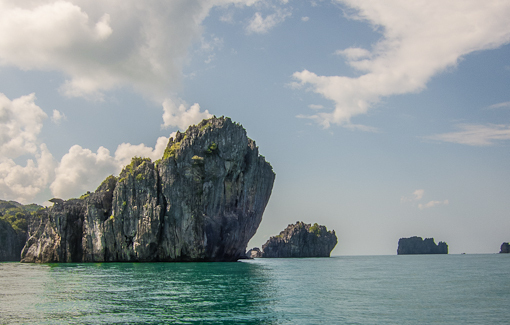 The national park consists of 42 small islands covering a total area of about 102 km². The park was established on November 12, 1980. While the map used in the movie indicated that the Beach is located on one of these islands, the movie was not actually shot here. 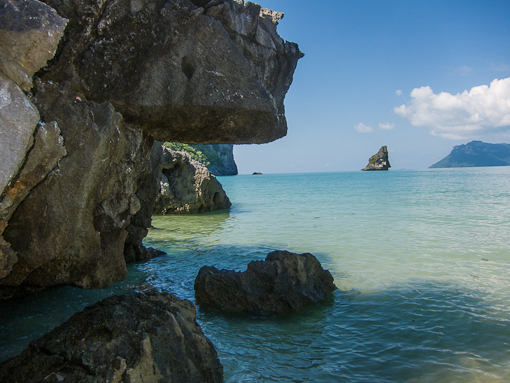 It was made on Ko Phi Phi Le on the other side of the peninsula. Nevertheless, the islands are stunningly beautiful. The day we went on the tour, the sea was relatively calm. We wandered how much empty space there is back there. One can kayak into that arch and get through to the other side. 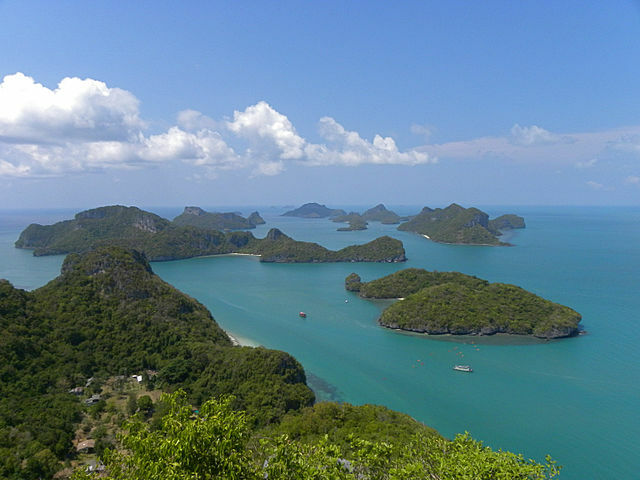 Our itinerary of the day consisted of cruising between the islands in the Gulf of Thailand, snorkeling at Ko Wao, visiting a lagoon on Koh Mae Koh, lunch at Ko Paluay, and swimming/kayaking at Song Nee Pong beach also on Ko Paluay. 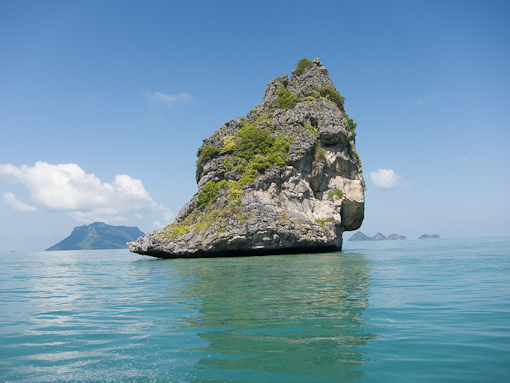 The speedboat circled some of the islands allowing us to see them up close. 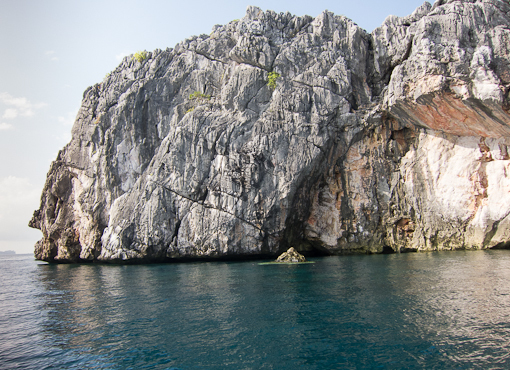 This was our snorkeling site for the day. There were a lot of fishes around that little piece of rock in the middle. But of the three snorkeling sites we visited the day before, the best was the one at Ko Tao, both in terms of the variety and density of viewable marine life. 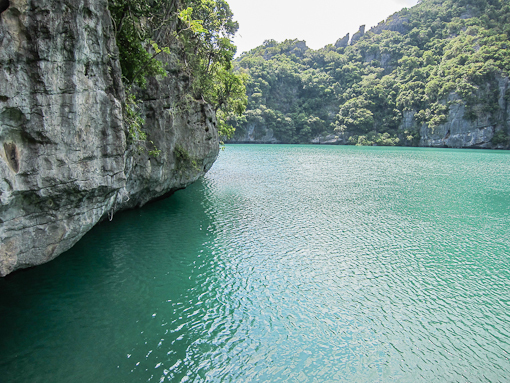 To see the lagoon on Koh Mae Koh, we disembarked at a beach and climbed up a series of metal stairs. At the top is a viewing platform perched on the rim of the lagoon. 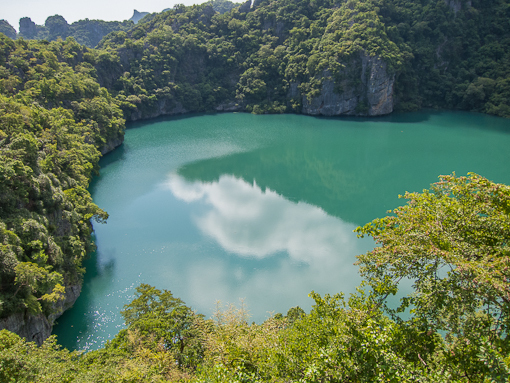 This lagoon is more like an inland lake surrounded by cliffs and jungle. It is clearly visible on Google map (above). We then went down another series of stairs to reach the surface of the lagoon. 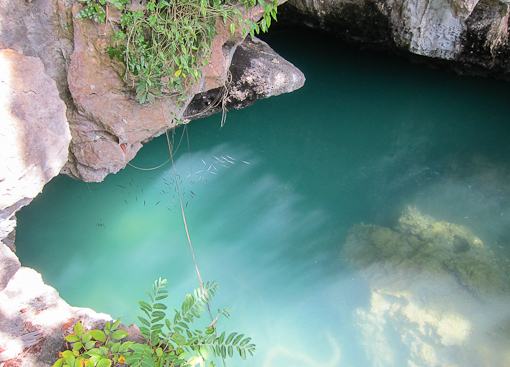 According to the guide, the lagoon is connected to the Gulf as the water level fluctuates similarly and it is full of sea urchins. 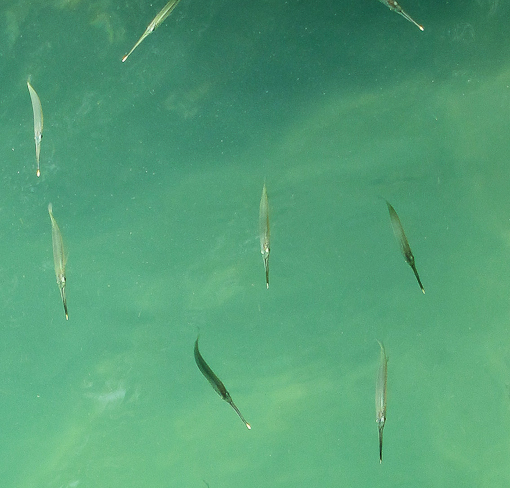 We only saw these long-nosed fish. 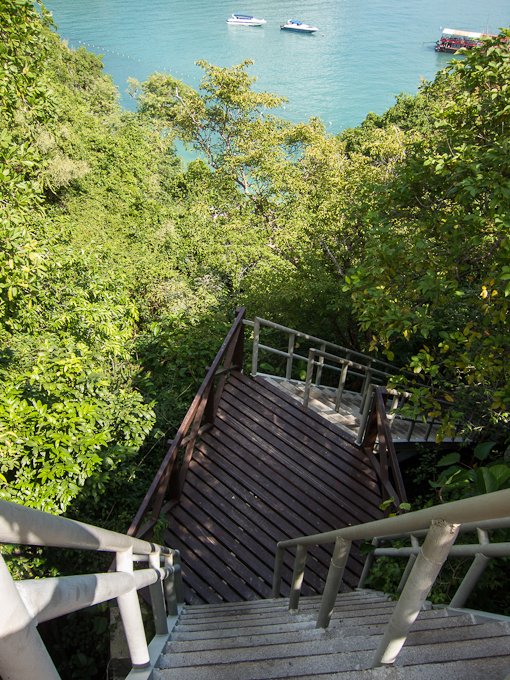 The stairs to get to the lagoon were so steep and shallow that they were essentially ladders. 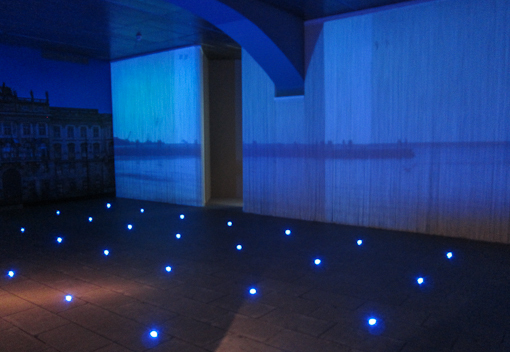 The area is now relatively accessible to tourists but it has forever lost the mysterious allure suggested by the movie. More stunning sights of the islands in part 2 to follow.